I watched as Dean carefully placed the finishing touches on the hand railing that would help people walk up the stairs and into the church. The big heavy posts made out of cast iron, were hand-picked by Deano and he painstakingly made everything exact and perfect, per the norm. The outside was looking good as Deano pulled weeds in the parking lot and I watered marigolds by the front steps. The lawn was mowed, the pink lemonade made, coffee pot was set to brew, Grandma’s dishes were brought out, antique silverware was washed up, and cups were arranged, all in preparation for the big event. Three tables were arranged with antique table cloths outside in the churchyard, while three were set up inside the church building. Jenessa, my youngest, made a special trip to Walmart for some lovely deep gold sunflowers and I watched her arrange them in Grandma’s white knobbed vase, setting them on the long table, inside the kitchen area. Hymnals were placed at each pew, and I arranged the microphone for Pastor Lewie. We were set to go and I felt a huge feeling of excitement permeating my spirit. I have to admit, this past year has been a whirlwind. On Thursday, Dean and I celebrate our eighth wedding anniversary. I asked him while he was setting up chairs for this hymn sing, if he was tired, and he said, “Only for the past eight years,” and smiled! He told me, “You’ve been keeping this farmer very busy.” But tonight something deep inside our spirits was lifted, and a feeling of Holy Spirit-expectancy seeped throughout our beings … we could hardly wait to see what God was going to do tonight. As we prepared for the event, I wondered who would show up, as I knew friends had invited friends, and the Benson paper had advertised our first-ever hymn sing/pie social for Frank Lake Church in the Grove. Dean and I greeted person after person, as they walked through the doors, many of them carrying big, delicious looking pies. It had been about forty years since I had been to a hymn sing, let alone a pie social. There was electricity in the air. In walked our friends, Dennis and Marie Johnson, along with Richard and his wife (who sold us the church for $1.00). Behind them came a couple who was the son of the last pastor that served at Frank Lake Church, along with friends from neighboring towns, and even friends from over an hour away. I watched and smiled as they all filed in one by one, laughing, high-spirited, and anticipating a time of worshiping and fellowship. I looked around at this sweet old building and I could imagine what it must have been like in 1900 when the first services took place and people milled about preparing for service. It amazes me that it never feels crowded. 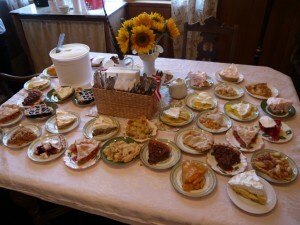 Delectable homemade pies were spread out on the counters and across the table. 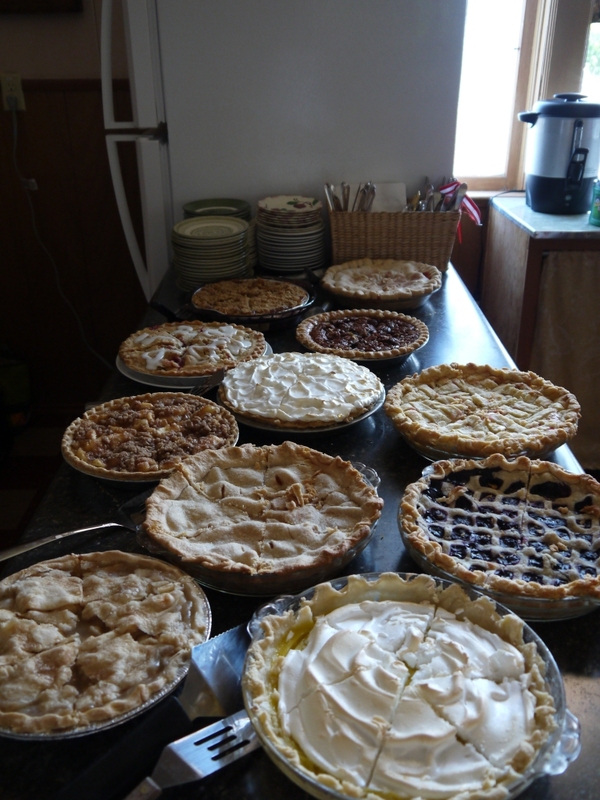 I had never seen such a myriad of beautiful pies in my life! Countless flavors, including blueberry, strawberry, peach, apple, cherry, banana cream and lemon meringue, just to list a few, all to be devoured, after the time of worship, set out looking absolutely delicious and waiting for the fellowship time. As each person entered, I asked them to write down their favorite hymn on a small slip of paper. Over seventy people took their places in the old pews, grabbing their hymnals, and I began by reading off the names of the hymns and one by one, the person who chose that song would tell why they felt a connection with that song and why it was meaningful. The music began to flood the church and I felt that same old feeling, like I was thrust back in time to the little church in Iowa, where I played at age 12 for each service. I bit my lip and held back tears, but relished in the fact that I was there, this was our church, these were our friends (and strangers who will become friends), and we were together, worshiping God! Sweet friends Marge and Marie each took a turn at accompanying the congregation, and with each hymn, I listened carefully to the words and the beautiful harmonies of the voices. It felt as though there were two hundred people there, and I could imagine that not only was God pleased, but that if the people from 1898, who started this church, could have heard it, they would have been pleased as well. My old friend, Pastor Lewie, gave a short time of devotion and reminded us that our times of prayer need to be refreshed and re-invented as we talk with God daily and thank Him, devoting our days to times of true prayer. Before I prayed corporately, I looked across the crowd, and I thanked them. I thanked the Johnsons for selling us the building, I thanked the men who were there who built our bathroom, our carpenter, Al, my Bible study friends, Uncle Gary and my husband Dean, and everyone who had encouraged us through prayer and petitions to purchase this old building. 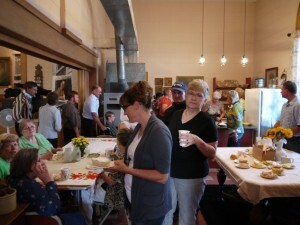 Pastor Mark, a neighboring friend once told me, “Kathy, this was the best idea ever, because ministry needs to begin at home, and then spread out from there.” I remembered his words as the people passed the offering plates and donated to paint the church. One of our sweet neighbors felt led to have the church painted and whatever we did not collect in offering, they committed to covering the rest. That is community … that is provision … that is God at work. This morning, as the birds are chirping outside my window, and the rain drips front the roof, I can see the church next door, through the trees and I finish up my duties here so that I can head off to my job … next door … at the church. 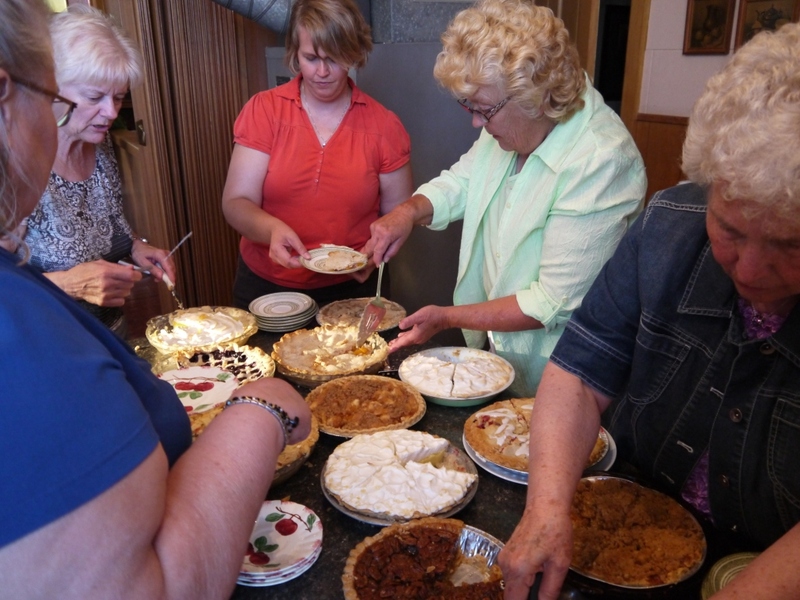 I can almost hear the hymns still ringing in my ears … and I certainly will have a piece of pie for mid-morning snack. Life is good … out here in the grove.